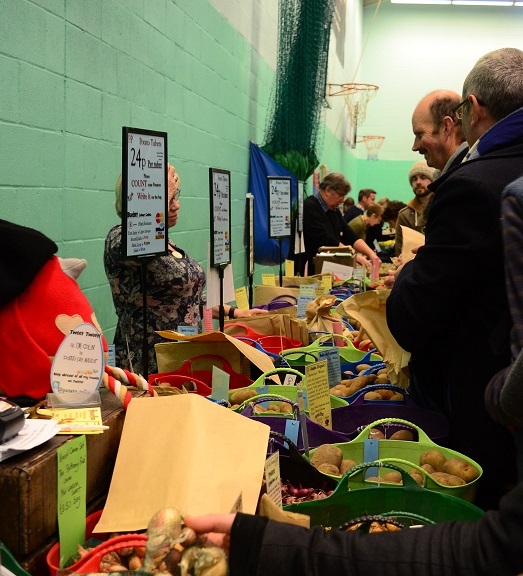 Brighton’s Seedy Sunday was circled in red on the calendar for months. My Tintin bag was crammed with 150+ packs of seeds for swapping and just generally culling from the overflowing seed boxes at home. It was a different experience to last year’s, which has its own post here, not just because it was in a new larger, venue (over a very STEEP hill, ooof! Brighton’s not flat…) but also because I was volunteering. I’ve always thought you should judge organisations on how they treat their lowest-paid staff, in this case volunteers. 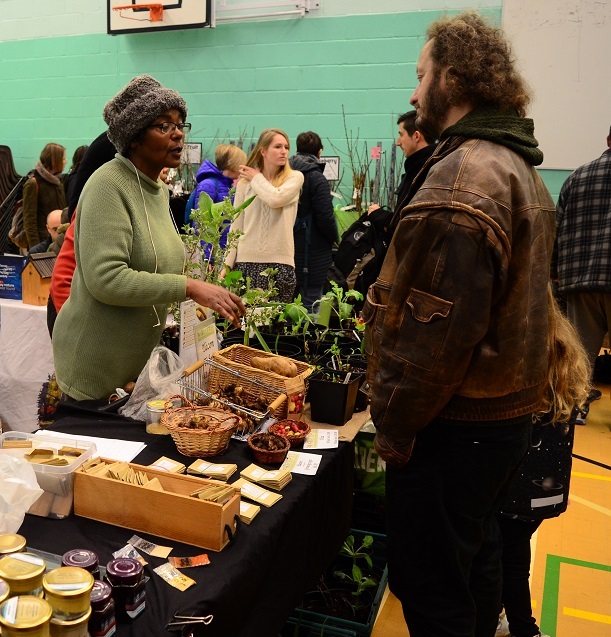 Seedy Sunday treats you like royalty, not just waiving the entrance fee and making you feel special for pitching up, but giving you free tea and cake (cake!) and a big bag of chocolates as you leave. This is for a two-hour stint of stewarding. Two short hours of very well-behaved, smiley, non-heckling punters. The presentations were generally great too, bar the one on pesticide use which I felt could have been less Eeyore-ish and doom-laden. It’s a chance to hear what else is going on in the world of seeds & growing. I definitely want to keep tabs on Dr Adrian Ely’s work at the Science Policy Research Unit, Uni of Sussex on seed development & patenting (not something I like the sound of) and the Open Source Seed Initiative. And I was pointed in the direction of Laura Pottinger, who’s had (for me) a dream PhD topic of looking at how & why people save seeds. I am very much looking forward to reading her findings when they go online. 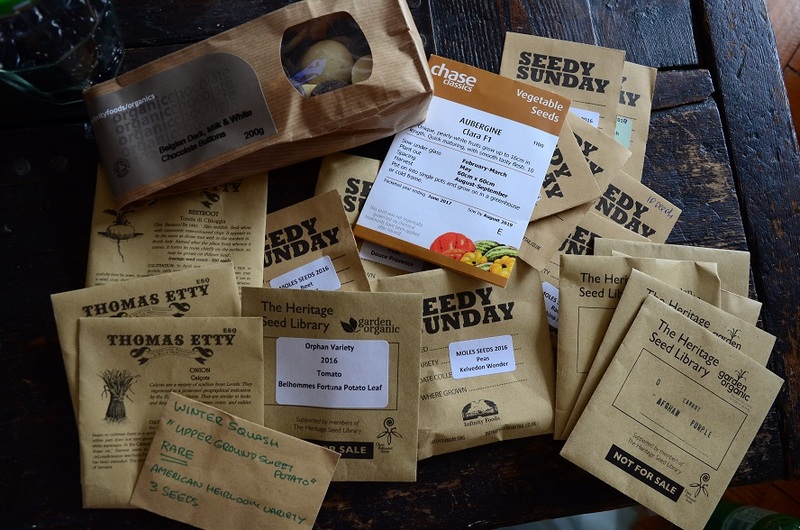 OSSI is a genuinely brilliant concept and supported by seed companies like Real Seeds, who’ve just recovered from the website-crashing onslaught of orders brought on by a mention in an Observer article. On that tangent, Thomas Etty said they had 160 orders for skirret when Vicki Cooke from Hampton Court’s kitchen garden featured it in the Telegraph. But two things from the event make me wonder a) if people trust self-saved seeds from others, and b) whether there shouldn’t be more emphasis on teaching practical seed saving: cleaning and drying the seed too but most importantly pollination and isolation. The first was that my carefully saved cucurbit seeds were going to be thrown away. Being the slightly obsessive person I am, I checked what was happening, and was told that there was a general distrust of self-saved anything which doesn’t self-pollinate, squash seeds in particular. But it was really interesting to see squash and courgette seeds were one of the first to run out, along with broad beans & beetroot. All of which need isolating so they breed true. For next year I’ve been advised to mark my seeds as ‘guaranteed isolated/true’ or they’ll be weeded out. The second was that audience statistics (we were given techy clicky things!) 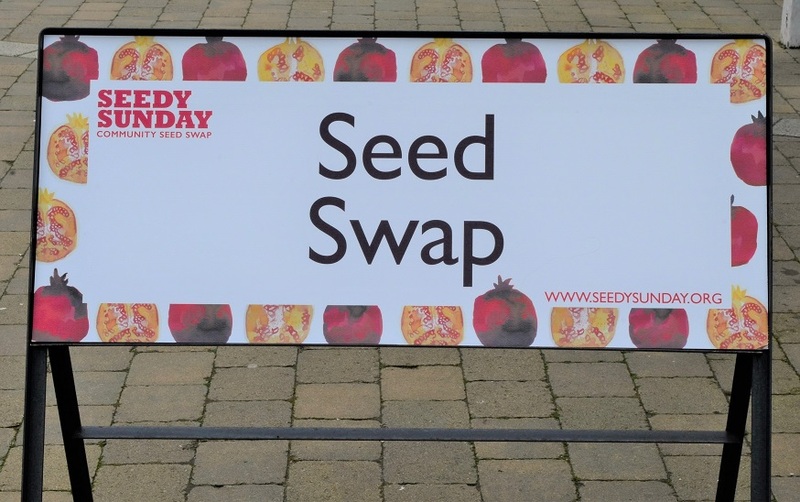 from the SPRU presentation showed that 85% said they saved their own seeds, 91% wanted to go home with seeds from the event but only 37% brought some to swap. It was a small sample (about 100) and there wasn’t time to go into why, but, from questions popping up everywhere on growing forums right now, it seems people are keen to save seed, but don’t know how to – or perhaps don’t have the confidence or patience to, or just don’t want to listen (that last is born of my frustration with an exchange about saving beetroot seeds!). Being a bit of a seed nerd I want to do more to spread the word that it’s not difficult – and I hope that the Twitter seed circle (now open, please join!) will help encourage more people to try. 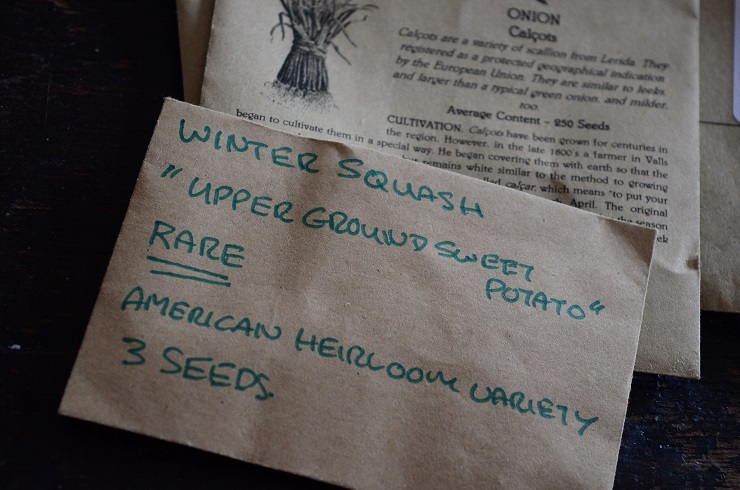 I’ve come away with some real finds from the stalls and from the swaps table this year, including Upper Ground Sweet Potato Squash, which is irresistably described as a ‘going the way of the dinosaurs if people don’t work to save it’. I also bagged some great potato varieties, Hungry Gap kale, Afghan Purple carrots, cardoons, calçots, and the intriguingly named Belhomme’s Fortuna Potato Leaf tomato, about which there is very little information. More importantly my will-power held and I DIDN’T come home with a nectarine, a medlar, a jostaberry or two nor any intriguing herbs. That’s for next year when my plots are fully tamed*. Total spend: £2.00 – plus a train ticket. Ah my cunning plan is working! It’s a great day out. See you there! I can see their point, I’d hate to waste time on seeds that weren’t what I thought they were. I have searched in South Wales to no avail so far this year. National Botanic did one last year but sadly have not repeated. Possibly for next year I need to persuade someone that this is some thing Wales needs to do to amd help out. I was looking forward to reading about how it went, well done on resisting, not sure I would have. 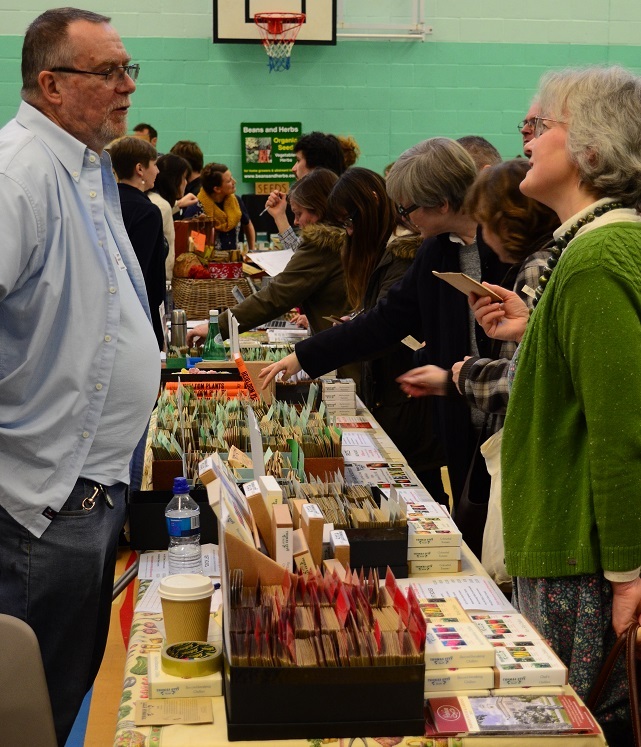 I still came away with around 20 packs of seeds…:) There’s a Seedy Saturday in Carmarthen on 4th March and one in Cardiff at Chapter on 25th Feb – would either of those work for you? Amazing, actually both could work. I must have been looking in the wrong place. Was this off Seedy Sunday website as I was sure I looked there a couple of weeks ago. Thank you, I know Chapter well. No probs. It was from a thread on the GYO magazine’s forum. Though I had to google them too as the forum’s server fell over a few weeks ago and most of the attachments have been lost. That sounds fab! I really need to find out about these types of events near me. 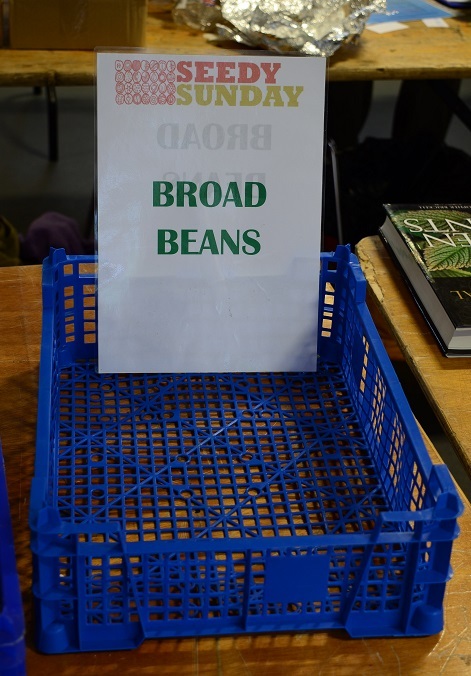 They’re well worth going to – I think there were about 50 potato varieties, as well as all the seeds & plants.